Share his enthusiasm as he launches a career in the kitchen that might lead to his own signature restaurant some day! 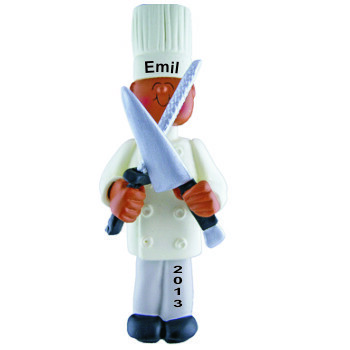 The African American male culinary school graduation personalized Christmas ornament with his name on it tells him that you believe he's on his way to something great. These chef graduation ornaments personalized to be mementos long enjoyed are hand lettered in a handsome font and feature an attractive cord to display the ornament wherever it brings the most pleasure. The culinary school graduation ornament for an African American male arrives in our custom velvet gift and storage pouch.